We are extremely proud of the growth we continue to experience and we continue to prove that we are a premier partner in the healthcare accounts receivable management industry. 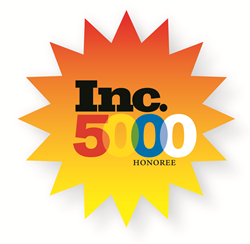 State Collection Service, Inc., a full-service accounts receivable management solutions provider, is pleased to announce its naming to the 36th annual Inc. 5000 list of America’s fastest-growing companies. The list represents the most comprehensive look at the most important segment of the economy – America’s independent entrepreneurs. Companies such as Intuit, Zappos, Under Armour, Microsoft, Jamba Juice, Timberland, Clif Bar, Pandora, Patagonia, and Oracle all gained early exposure as members of the Inc. 5000. Given its relatively small size, only a small number of businesses around the nation ever make it to Inc. 5000’s List of Fastest Growing Private Companies. A much smaller percentage make it on the list multiple times. In addition to being named to the list again this year, State Collection Service has improved its overall ranking to #3831 from #4800 in 2015. The 2017 Inc. 5000 is ranked according to percentage revenue growth when comparing 2013 to 2016 and is the most competitive crop in the list’s history. To qualify, companies must have been founded and generating revenue by March 31, 2013 and meet specific revenue requirements. They must also be U.S.-based, privately held, for profit, and independent – not subsidiaries or divisions of other companies – as of December 31, 2016. The average company on this year’s list achieved a mind-boggling three-year average growth of 481%. The Inc. 5000’s aggregate revenue is $206 billion, and the companies on the list collectively generated 619,500 jobs over the past three years. In addition to being recognized on the Inc. 5000 list this year, State Collection Service has been recognized with various other honors including the Wisconsin Family Business of the Year and as one of the Best Call Centers to Work For in 2017. The company has been presented with SpeechTech Magazine’s Implementation Award for impressive deployment of speech analytics technology and State Collection Service continues to maintain its Peer Reviewed by HFMA designation from the country’s largest association of healthcare finance professionals. Since 1949, State Collection Service has provided quality collection service to countless healthcare organizations. The company's core principles reflect desire to deliver exceptional ethics and integrity through strong customer relationships and collection practices. Through experience and innovation, State Collection Service has grown to become a tremendously credible and nationally-recognized receivables management firm offering services from pre-registration to bad debt. It is upon the basis of ethical behavior and a dedication to integrity that each State Collection Service employee works to uphold the company's vision – Partnerships for a Lifetime.